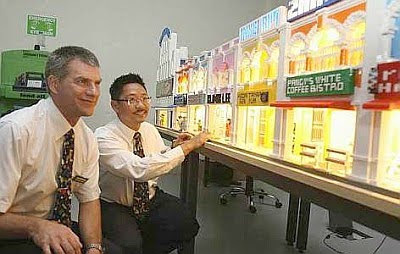 Siegfried Borst (left) and Zainal Ashikin Muhammad Rejab looking at a model of pre-war shop houses made of Lego bricks. NUSAJAYA: Legoland Development, the operator of Legoland Malaysia Theme Park being built here, expects to see one million visitors passing through its gates in the first year of operations. Legoland Malaysia Project senior director of operations Siegfried Borst said the company was confident of achieving the target based on the high number of family institutions in the region. He said unlike in developed countries where the birth rate was declining from year to year, most Asian countries still recorded high birth rate. “Our theme park targets families with young children aged between two and 12 years old and this demographic serves our business strategy well,'' said Borst. He was speaking at a press conference after a tour for the media to preview the ongoing development at the Legoland site. Borst said work on the RM720mil project was progressing well and the theme park was expected to open its doors to visitors towards the end of 2012. The 26ha theme park will offer 40 interactive rides, shows and attractions. It is located in the centre of a 59ha site in Medini North, a zone dedicated to lifestyle development. Legoland Malaysia Theme Park is the first component to be developed within Legoland Malaysia Resort. The whole project will also have a retail mall, themed hotel, business hotel as well as office and residential areas. “We are yet to determine the entrance charges. Our next priority is to talk with potential trade partners to market our park,'' he said. Borst said unlike other Legoland theme parks which only operated eight months a year and closed during winter, Legoland Malaysia would operate all-year round. He said the main challenge in developing the park in Malaysia was the “sun and rain”, thus more covered pedestrian walkways needed to be built and trees to be planted. The other Legoland theme parks are Legoland Billund (Denmark), Legoland Windsor (near London, Britain), Legoland Deutschland (Germany) and Legoland California (the United States). Legoland Malaysia will have miniature replicas of iconic buildings and structures from across Asia. These include Petronas Twin Towers and India's Taj Mahal. IDR Resorts director Zainal Ashikin Muhammad Rejab said Legoland Malaysia would create about 1,000 jobs for locals and bring spillover effects to Nusajaya. IDR Resorts is part of Iskandar Investment Bhd (IIB). IIB had, in December 2008, signed an agreement with Merlin Entertainment Group, which will design and operate Legoland Malaysia. Zainal said with the opening of Legoland Malaysia, IIB would position Medini North as a tourism hub in the 9,712.45ha Nusajaya. “An indoor theme park is also coming up at Puteri Harbour just a few kilometers away from Legoland Malaysia and both parks will complement each other to attract visitors,” he said. The government-backed IIB was formed on Nov 3, 2006 to drive commercial initiatives in Iskandar Malaysia via joint ventures and by offering its land. Tradewinds plans to demolish Crowne Plaza Mutiara Hotel and Kompleks Antarabangsa to make way for a new property project. 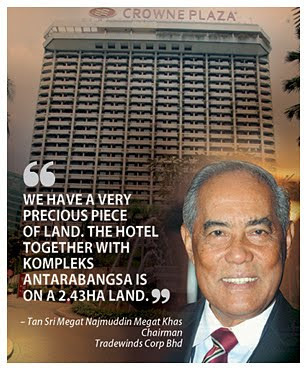 Tradewinds Corp Bhd, controlled by businessman Tan Sri Syed Mokhtar Al-Bukhary, plans to demolish two of its prized assets in Kuala Lumpur to make way for a "multi-billion-ringgit" mixed commercial development. This means that the Crowne Plaza Mutiara Hotel and Kompleks Antarabangsa, both located on Jalan Sultan Ismail, will make way for a new property project. Chairman Tan Sri Megat Najmuddin Megat Khas said the plan is in the advanced concept stage and could take more than a year to start. However, the development order for the site plan is already out. "We have a very precious piece of land. The hotel together with Kompleks Antarabangsa is on a 2.43ha land," Megat Najmuddin told Business Times in a phone interview. Tradewinds, he said, is looking at the possibility of building an office, retail and residence component on the land to provide the group with a recurring income stream. On how high it would be or would it be just a single tower, he said it will be "something soaring". Megat Najmuddin added that the cost of construction would be in the tune of "billions" of ringgit. Based on Tradewinds's latest annual report, the hotel is 38 years old, while Kompleks Antarabangsa is 30 years old. Crowne Plaza Mutiara is a 35-storey hotel with 565 rooms while Kompleks Antarabangsa is a 21-storey office building with five-split level car parks. As at December 31 2009, the net book value of the office building is RM159.83 million. In April last year, Tradewinds's 85.1 per cent unit, Tradewinds Hotels & Resorts Sdn Bhd, entered an agreement to sell Crowne Plaza to Symbolic Supreme Sdn Bhd for RM384 million. Tradewinds owns 100 per cent of Symbolic Supreme. The transfer is to facilitate the development. Based on recent land deals in Kuala Lumpur, the building together with the land may now be worth some RM1.5 billion. The Crowne Plaza is managed by the InterContinental Hotels Group (IHG). It is understood that IHG may still have eight years remaining under the management contract. Prior to IHG's management of the hotel, Tradewinds managed the hotel on its own for a short period under the name Mutiara KL. The hotel first opened as the Kuala Lumpur Hilton. Tradewinds also owns Hotel Istana, which is located a stone's throw away from Crowne Plaza and Hilton Petaling Jaya and Hilton Kuching. Other properties under the group include Menara Tun Razak on Jalan Raja Laut, Kuala Lumpur. PROPERTY developer SP Setia Bhd's proposed private placement of up to 15 per cent of its paid-up capital is expected to raise up to RM1.2 billion to fund its existing and future expansion. "We hope to raise between RM1 billion to RM1.2 billion from the proposed private placement," president and chief executive officer Tan Sri Liew Kee Sin said after SP Setia's extraordinary general meeting (EGM) in Shah Alam yesterday. The exercise would only dilute minimally the company's share capital base, he added. Liew plans to maintain his shareholding after the exercise. although another major shareholder, the Employees Provident Fund, wanted to raise its stake "a little bit more". "We cannot speculate on the shareholding spread of these major shareholders," he said. The EPF is its second largest shareholder with a 14.95 per cent stake as at December 30. Skim Amanah Saham Bumiputera is the largest, with a 20.11 per cent stake. Liew owns 9.19 per cent. SP Setia said the private placement would involve a bookbuilding exercise, which includes a roadshow involving about 30 global funds. At the EGM, shareholders approved the proposed placement and bonus issue on a one-for-two basis after the placement. "This (private placement) will provide us with ample funds to strongly launch three sizeable new projects without having to forego exciting new landbanking opportunities which may come our way," Liew said. The three major projects planned for launch this year are the KL Eco City - which is opposite the MidValley - Setia City in Setia Alam in Shah Alam and Fulton Lane in Melbourne. They have a combined gross development value of RM12.5 billion. The group is also negotiating with the government on a swap deal to buy 16.2ha of prime land in Bangsar in exchange for a new health and research complex on a 22.28ha site in Bandar Setia Alam. "Apart from projects which are already in the pipeline, we are still aggressively scouting for good landbank to lock in future growth," said Liew, adding that SP Setia has 1,494ha of undeveloped land at the moment. Liew said SP Setia has achieved a quarter of its yearly target sales of RM3 billion in the first quarter ended January 31 2011. "We are off to a running start on our current year sales target with RM737 million sales already locked in," he said. JOHOR BARU: Uda Holdings Bhd will invest between RM200mil and RM250mil to develop Angsana II commercial project, adjacent to its existing Plaza Angsana shopping complex here. Chairman Datuk Nur Jazlan Mohamed said the project was in planning stage and construction was slated to begin by year-end. “We are looking at a joint-venture basis and will be inviting interested parties to submit their proposals,'' he told StarBiz on Monday after witnessing the signing of service agreement between Telekom Malaysia Bhd (TM) and United Malayan Land Bhd's wholly-owned subsidiary Seri Alam Properties Sdn Bhd. He said Uda was looking at developing the project on a joint-venture basis with land owners. The proposed Angsana II commercial project will be the first shopping complex which incorporates a street-mall concept in Johor Baru. On the Johor Baru city transformation, Uda had been “informally invited” to participate in the project, said Nur Jazlan, adding that the company was keen on it. On another development, he said Uda had shortlisted 10 out of 14 local and foreign companies which had submitted their proposals to redevelop the former site of Pudu jail into an integrated property development project on a joint-venture basis. “They are going to present their proposals before the board of directors this month, “ Nur Jazlan said, adding that names of the winners would be announced by the end of March. SHAH ALAM: SP Setia Bhd shareholders approved a proposal for the placement of up to 15% of its issued and paid-up share capital. This would involve the issuance of up to 152.52 million new shares, said SP Setia president and chief executive officer Tan Sri Liew Kee Sin after the company's EGM and AGM. The company hopes to raise between RM1bil and RM2bil from the proposed placement which will be done via a book building exercise. The placees are SP Setia major shareholders Amanahraya Trustees Bhd (20.12%), a wholly-owned subsidiary of Permodalan Nasional Bhd, the Employees Provident Fund (14.47%) and Liew (11.96%). The proceeds from the placement will be used for three major new projects that are being planned for this year. Some RM762mil will be utilised for its projects in KL Eco City, Setia City in Setia Alam and Fulton Land in Melbourne. These three projects have a combined gross development value of RM12.5bil. The group is also negotiating with the Government on a land swap deal to acquire 40.22 acres in Bangsar in exchange for a modern integrated health and research facility to be constructed on 55.33 acres in its Setia Alam township. On the National Institute of Health (1NIH), Liew said the project would stimulate growth in the Setia Alam township as there would be a few thousand civil servants working in the facility. “They will be working, eating and playing within the township. Setia Alam will become like any other modern urban living place in Malaysia. “We are now in discussions with the Government to build 1NIH. We will probably commence work in six months' time. 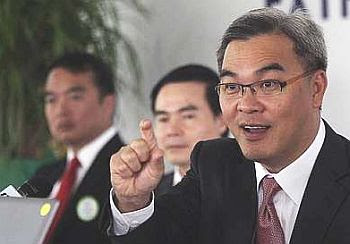 Once we deliver 1NIH, then we will start to develop the Bangsar land,” said Liew. Some RM245mil to RM430mil from the placement proceeds will be earmarked for 1NIH, the Bangsar land and further landbanking acquisitions. Liew said the Bangsar land was very prime Government land. It would be a mixed residential development with the theme of being Bangsar's cultural centre. “Bangsar is where the upper middle-class people live. We plan to build a museum for artists, a library and a performing arts centre,” said Liew. Out of the 11 blocks of buildings in KL Eco City, SP Setia plans to maintain one office tower block of 515,738 sq ft and retail space of 313,605 sq ft for its own use. “We want to tell our buyers, we will be there, and we will anchor the tower for you. The rental in the Gardens, Mid Valley, which is just opposite our development, is RM8 psf. We are hoping to achieve that same kind of yield,” Liew said. SP Setia is the largest developer in Malaysia in terms of sales. For its year ended Oct 31, 2010, it achieved a new sales record when its revenue increased 40% to RM2.31bil, while net profit was up 47.06% to RM251.81mil. It is targeting a 30% increase in revenue to RM3bil for its current financial year. The group's shareholders also approved a proposal for bonus issue on the ratio of one new share for two existing shares held after the proposed share placement. They also approved SP Setia's proposal to increase the authorised share capital to RM2.25bil comprising 3 billion shares from RM1.2bil comprising 1.6 billion shares currently. Property development company Hua Yang Bhd plans to expand its presence to Sabah and Sarawak in the next two years. Its Chief Executive Officer Ho Wen Yan said for now he saw Kota Kinabalu as the best entry point for the company to penetrate the new market. "We have identified Kota Kinabalu as a growing vibrant city with strong economic growth in Sabah and Sarawak, due to tourism, plantation, timber as well as oil and gas. "We are in talks with several parties from Kota Kinabalu, and expect to have at least one project there within one or two years," he told reporters after a media appreciation luncheon here, today. Ho added the company would start off with a small project in Kota Kinabalu in order to test the market. "We are looking for affordable residential development and township development. "The affordable segment is always very resilient. The RM90,000 to RM400,000 price range demands are currently very strong and we expect it will remain strong for the next two years," he added. The thriving Penang property market has gotten off to a robust start this year with a new development planned for Jelutong. Tambun Indah Land Berhad has proposed to acquire the entire equity of Premcourt Development Sdn Bhd, and will undertake a mixed strata development project in the area through Premcourt. The project, with a gross development value (GDV) of RM180mil, involves a 1.69ha piece of land in Jelutong. Tambun Indah managing director Teh Kiak Seng said the project was located “in the heart of the island” and would feature modern apartments, office suites and shoplots to meet the demand for commercial and lifestyle properties in the central business district. “We anticipate to commence development in the fourth quarter of the year. “Targeted completion is by the fourth quarter of 2014,” he said in a statement. Teh said he was optimistic on the outlook of the Penang property market in light of the government’s commitment to continuously improve the infrastructure and provide incentives to attract corporations to establish and expand their facilities in the state. He said besides Premcourt, Tambun Indah had proposed to acquire Pridaman Sdn Bhd and Ikhtiar Bitara Sdn Bhd. “Pridaman and Ikthiar have landbanks on the mainland. “The purchase consideration for the acquisition of all three companies is RM11.6mil which will be through internally-generated funds. “Development projects via these companies are expected to contribute approximately RM38.7mil in pre-tax profits from 2011 to 2014,” he said. He said the proposed acquisitions would increase the group’s GDV by RM245mil and its landbank to 96.3ha. The layout plans for the projects in Pridaman and Ikhtiar Bitara have received the necessary approvals from the relevant authorities and work is expected to commence soon. The authorities have been urged to build more interconnecting roads between housing estates as a means to reduce the traffic congestion on the Damansara-Puchong Highway (LDP). Barisan Nasional chief coordinator for Puchong, Datuk Lau Yeng Peng said motorists had to use the LDP not only to get out of Puchong but also to move from one housing estate to another within Puchong. “It would help ease the traffic problems here if there were more roads between residential areas,” he said during a meeting he initiated with LDP concessionaire Litrak at his office in Puchong to highlight the long-standing traffic woes. “Residents coming from the back end of Puchong go through the Plaza Puchong Barat toll plaza. He said to avoid this, many motorists headed to the Elite Highway using the route that took them past the Proton plant. “Unfortunately, sometimes this route too gets jammed up in the morning, especially at the traffic lights that are right before the turning into Elite Highway,” he added. Lau, who is Puchong Gerakan division chairman, also urged the Subang Jaya Municipal Council (MPSJ) to relocate several bus stops and taxi stands along the LDP so that traffic flow would not be interrupted. “Traffic jam is not a new problem. It has been there for so long and we do not see any positive measures taken by the state government to overcome the problem,” he said. At the briefing, Litrak CEO Sazally Saidi pointed out that since 1999, when LDP was built and started operations, it had undertaken RM900mil worth of enhancements on the LDP. Of that number, he said, some 260,000 vehicles passed through the Penchala and Sunway/PJS toll plazas while 180,000 vehicles passed through the Putrajaya and the USJ/PJ toll plazas daily. Lau said other contributing factors to the jam were not only the increase in vehicles plying the LDP but also the spillover traffic from the Federal Highway where some one million motorists ply daily. “If the Federal Highway gets choked up in the morning, the backflow can go as far as the Sunway toll,” he said. Sazally assured that Litrak would be upgrading LDP in Puchong by widening road shoulders and building an additional flyover alongside the existing flyover near the Puchong United club. MK Land Holdings Bhd posted a higher pre-tax profit of RM6.019 million for the second quarter ended Dec 31, 2010 from RM3.454 million in the same quarter of 2009. Its revenue increased to RM66.067 million compared with RM48.448 million previously. For the first six months ended Dec 31, 2010, MK Land recorded a higher pre-tax profit of RM11.631 million compared with RM4.791 million in the corresponding period 2009. The company's revenue, however, declined to RM127.845 million from RM129.257 million previously. MK Land expects an improving economic climate and a resilient property market to be the key drivers for its sales growth going forward. The company anticipates a better financial performance for the financial year ending June 30, 2011.